In 1945, Officine Meccaniche Eden Fumagalli, based in Via Gaetana Agnesi in Monza, manufacturers of precision instruments for machine tools, created "Model 50", the first all-Italian washing machine, which was presented to the public at the Fiera di Milano in 1946. During that same year, Officine Meccaniche Eden Fumagalli, belonging to Eden Fumagalli and his three sons, Niso, Enzo and Peppino, transformed and reorganised the production. And the result was a new company: Candy. The business first took off when Enzo sent sketches and descriptions of the electrical washing machine from the United States. 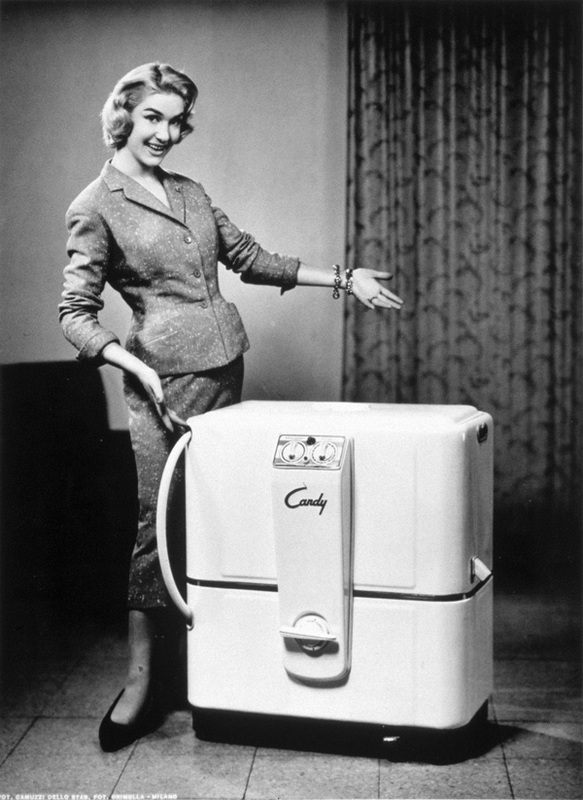 By then this type of appliance was already commonplace in American homes. Niso, who had launched the industrial business along with his father Eden, decided to focus on appliances. Peppino, the third of the brothers, took it upon himself to set up the administrative and management side of a business which was destined to grow. Having gained notable experience in the washing segment between the 1950s and 70s, with the launch of automatic washing machine models that would establish the European standard still in use today, or dual compartment automatic dishwashers with different washing cycles, the Group development strategy focused on diversifying the product lines and extending the ranges; a rapid growth that was also completed by takeovers, proving a success for both the free-standing and built-in lines . In 1971, the takeover of Kelvinator Italia was finalised; an agreement was also reached with Kelvinator USA for the worldwide manufacturing and sale of this brand of domestic appliances. In 1973, the Group’s range of large appliances was extended when it purchased La Sovrana of Sorbolo (Parma), a historical brand of cooking appliances. In 1980 Candy bought Kelvinator UK and its production plant in England. In the eighties, its other takeovers included Zerowatt (1985), manufacturer of washing machines and dryers; Gasfire (1985), a well-known brand of cookers, especially built-in models; Rosières (1987), the historical brand established in 1860, leader in France for cookers and built-in appliances. In 1992, Candy Group was joined by Mayc-Otsein (Spain), leader in top-loading washing machines, and, a year later, by Iberna, an Italian company specialising in refrigeration. In 1995, the Group bought Hoover European Appliances, including the exclusive license to sell the brand in Europe, the former Soviet Union and the Mediterranean area. Today Hoover, leader in floor-care, offers a full range of small and large appliances that stand out due to their high level of innovation, technology, excellent performance and attention to detail. In 2005, with no less than 60 years in business under its belt, Candy Group further expanded its production base and its range of national brands by purchasing Vesta which manufactures washing machines in Kirov, Russia, under the Vyatka brand. The plant was extensively modernised to accommodate the production destined for the Russian market. Half-way through 2006, Jinling joined the Group. The third largest brand of washing machines in China, it was purchased along with its research and development resources, industrial capacities and sales network. Its Asian vertical washing machines were joined by the “European-style”, horizontal models. At the beginning of 2007, the Group bought Doruk Ltd.-STI the market leader in Turkey with its Süsler brand. Incorporated in 1947, with registered office and plant in Eskişehir, it has become one of the Group’s prime production sites for cookers, hobs and ovens. In 2013, the Baumatic brand was purchased for the UK market. Baumatic is a well-known brand of appliances established in the United Kingdom in 1992. It specialises in built-in appliances, wine cabinets and free-standing cookers. At the beginning of 2017, a strategic partnership agreement was signed with Hefei Meiling Co., Ltd, a Chinese company listed on the Shenzen Stock Exchange. Meiling is one of the leading companies in the large electrical appliance market in China, thanks to its extensive distribution network and consolidated range of services. It produces and sells products in the cooling sector under the well-known brand Meiling. The joint venture will focus on the marketing and distribution of washing machines under the brands Candy, Jinling and Meiling in the Chinese market and marks the beginning of a strategic partnership in the field of cooling. Thanks to its long history, punctuated by many successes, and its extensive experience in the sector, today the Candy Group continues developing, designing, pioneering products capable of combining innovation and user-friendliness to meet the requirements of its customers and improve their quality of life.